Browse across a staggering range of half eternity rings, meticulously set and polished with round, princess cut, baguette cut and carré cut combinations. Mixed diamond shapes merge with varying width and luxurious precious metal combinations. All commissions are created in around 4 weeks, beautifully boxed and perfectly presented for life's precious moments. This exceptional Princess cut half diamond eternity ring features 0.65 carats of Princess cut diamonds, channel set within a comfortable court profile band, crafted over 4 weeks and set with G colour VS clarity Princess cut diamonds. Part of the Raphael Collection. Half channel set with diamonds. 3mm wide band. Carat weight 0.65 carats. F-G whiteness colour grade. VS clarity grade. 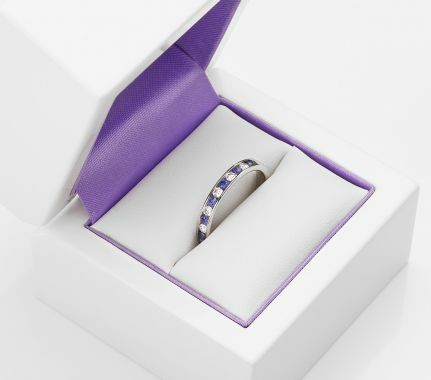 Supplied in pristine presentation box with bespoke Serendipity packaging. Includes certification and full insurance valuation within your parcel. Five perfectly matched dazzling white diamonds, held within a refined trellis setting. This five stone ring design boasts breathtaking design and dazzling brilliance in a wide choice of precious metals. The five stone diamond trellis ring demonstrates unfaltering beauty. An interwoven trellis of beautifully formed claws weave below a graduation of 5 diamonds—made available in a range of total carat weights combined with several choices for precious metal including ethical Fairtrade Gold. Princess cut diamond half eternity ring, set with 0.33cts of princess cut diamonds along a channel set 2.5mm ring. Channel Setting. 0.33cts diamonds. 2.55mm width. Princess Cut diamonds F colour VS1 clarity. Available in 18ct Yellow Gold, 18ct White Gold, 950 Platinum and 950 Palladium. Wood boxed. Gift packaged. 3 weeks for delivery. Adorable diamond half eternity ring, set with a length-ways oriented 1.20cts of clustered diamonds above a court profile band. 1.20cts of round brilliant cut diamonds. 4.7mm in width. 20 x 2.5mm diameter stones. Claw settings. F colour VS clarity. Approx. 3 weeks for delivery. Supplied wood boxed. Available in a wide choice of metal types. Half diamond eternity ring, 0.50cts of princess cut diamonds held within an offset channel across a 4.25mm wide band. Off-set channel setting. Princess cut diamonds. 4.2mm ring width. 0.50cts diamonds F colour VS1 clarity. Available in 18ct Yellow Gold, 18ct White Gold, 950 Platinum and 950 Palladium. Wood boxed. Gift packaged. 3 weeks for delivery. Princess cut half diamond eternity ring, with offset channel holding 0.25cts of princess cut diamonds across a 4.25mm ring design. Court profile. Princess cut diamonds. 4.25mm ring width. 0.25cts diamonds. F colour VS1 clarity. Precision channel set. Available in 18ct Yellow Gold, 18ct White Gold, 950 Platinum and 950 Palladium. Wood boxed. Gift packaged. 3 weeks for delivery. The ribbon twist diamond wedding ring remains a constant favourite wedding ring, set with dazzling grain set round brilliant cut diamonds. Elegant 2.3mm diamond set twist wedding ring, holding 0.10 carats of fully cut round brilliant diamonds 1.5mm in size. Each diamond is grain set on each shoulder of an elegant twisted design suitable to fit alongside an engagement ring setting. Please contact us if you are interested in a custom wedding ring service to create such a style to your engagement ring. Please allow around 3 - 4 weeks for us to produce this ring style. Elegant bowtie shaped diamond wedding ring featuring flush grain set diamonds. Half eternity ring, invisibly set with double row princess cut diamonds, 0.60cts in weight, across a 3.7mm wide band with channel setting. Princess cut diamonds. Two rows of diamonds. 3.7mm ring width. Channel setting. 0.60cts of diamonds. F colour VS1 clarity. Available in 18ct Yellow Gold, 18ct White Gold, 950 Platinum and 950 Palladium. Wood boxed. Gift packaged. 3 weeks for delivery. Channel set half eternity ring, holding 0.75cts of Princess cut diamonds along a 3.75mm wide band. Channel setting. Princess cut diamonds. 3.75mm width. 0.75cts weight. F colour VS1 clarity Precision setting. Available in 18ct Yellow Gold, 18ct White Gold, 950 Platinum and 950 Palladium. Wood boxed. Gift packaged. 3 weeks for delivery. Luxurious 0.75cts carré cut diamond half eternity ring, channel set with 0.75cts of square diamonds within a 3.75mm ring. Carré Cut Diamonds, Channel setting, Half diamond set. 3.75mm width. 0.75cts diamonds. F/G colour VS clarity. Available in 18ct Yellow Gold, 18ct White Gold, 950 Platinum and 950 Palladium. Wood boxed. Gift packaged. 3 weeks for delivery. Channel set diamond half eternity ring, beautifully set and finished with 0.25cts of Carré cut diamonds within a 2.7mm wide ring. Carré Cut Diamonds, Channel setting, Half diamond set. 2.70mm width. 0.25cts diamonds. F/G colour VS clarity. Available in 18ct Yellow Gold, 18ct White Gold, 950 Platinum and 950 Palladium. Wood boxed. Gift packaged. 3 weeks for delivery. Princess cut diamond shaped wedding ring created with 0.35cts of channel set diamonds along a gently shaped channel with 2.8mm ring width. Contoured design with slight curve to accommodate ring setting. Channel set Princess cut diamonds. 2.8mm ring width. Diamonds 1.8mm each. 0.35cts total weight. G / H colour VS clarity. Four weeks delivery. Wood boxed, gift packaged. Baguette cut half diamond set eternity ring, set with 0.25cts across a 3mm wide band with a precision channel setting. Half eternity ring. Baguette diamonds. Channel setting. 3mm width. 0.25cts diamonds. F colour VS1 clarity. Precision set. Available in 18ct Yellow Gold, 18ct White Gold, 950 Platinum and 950 Palladium. Wood boxed. Gift packaged. 3 weeks for delivery. Half diamond set ring, holding 0.30cts of baguette cut diamonds along a channel setting with a total ring width of 3.4mm. Channel setting. Baguette cut diamonds. 0.30cts diamonds. F colour VS1 clarity. 3.4mm width Court profile. Available in 18ct Yellow Gold, 18ct White Gold, 950 Platinum and 950 Palladium. Wood boxed. Gift packaged. 3 weeks for delivery. Baguette cut diamond half eternity ring, set with 0.30cts of diamonds along a channel setting within a 2.4mm wide band. Baguette cut diamonds. Half channel setting. Court profile. 2.4mm width. 0.30cts diamonds. F colour VS1 clarity. Precision setting. Available in 18ct Yellow Gold, 18ct White Gold, 950 Platinum and 950 Palladium. Wood boxed. Gift packaged. 3 weeks for delivery. Baguette cut diamond half eternity ring, holding 1 carat of baguette cut diamonds across a 4.7mm wide ring design. Baguette cut diamonds. Half eternity design. Channel setting. 1ct diamond weight. 4.7mm wide band. F colour VS1 clarity. Available in 18ct Yellow Gold, 18ct White Gold, 950 Platinum and 950 Palladium. Wood boxed. Gift packaged. 3 weeks for delivery. Half diamond eternity ring, holding 0.33cts of baguette cut diamonds across a half channel set 2.9mm band. Channel setting. Baguette cut diamonds. 2.9mm width. 0.33cts of diamonds. F colour VS1 clarity. Precision setting. Available in 18ct Yellow Gold, 18ct White Gold, 950 Platinum and 950 Palladium. Wood boxed. Gift packaged. 3 weeks for delivery. 1 carat carré cut diamond half eternity ring, featuring square step cut diamonds channel set within a 4mm wide ring design. Carré Cut Diamonds, Channel setting, Half diamond set. 4.00mm width. 1.00cts diamonds. F/G colour VS clarity. Available in 18ct Yellow Gold, 18ct White Gold, 950 Platinum and 950 Palladium. Wood boxed. Gift packaged. 3 weeks for delivery. Carré cut diamond half eternity ring, with 0.50cts of square cut diamonds held within the channel setting of a 2.65mm band. Carre Cut Diamonds, Channel setting, Half diamond set. 2.65mm width. 0.50cts diamonds. F/G colour VS clarity. Available in 18ct Yellow Gold, 18ct White Gold, 950 Platinum and 950 Palladium. Wood boxed. Gift packaged. 3 weeks for delivery. Half diamond set princess cut eternity ring, with 0.50cts of princess cut diamonds across a 2.65mm wide band. Channel setting. Princess diamonds. 2.65mm width. 0.50cts diamond weight F colour VS1 clarity. Available in 18ct Yellow Gold, 18ct White Gold, 950 Platinum and 950 Palladium. Wood boxed. Gift packaged. 3 weeks for delivery. 1 Carat princess cut diamond half eternity ring, claw set with 9 princess cut diamonds above a court profile band. Claw setting. 9 Priness diamonds. Court profile. 1ct diamond weight. F colour VS1 clarity. Available in 18ct Yellow Gold, 18ct White Gold, 950 Platinum and 950 Palladium. Wood boxed. Gift packaged. 3 weeks for delivery. Uniquely styled half eternity ring, set with a mixture of invisibly set princess cuts and baguette diamonds across a 3.9mm band. Channel set, Princess cut and Baguette cut diamonds. Invisible set princess cuts, 3.9mm width, 0.60cts of diamonds, F colour VS1 clarity. Available in 18ct Yellow Gold, 18ct White Gold, 950 Platinum and 950 Palladium. Wood boxed. Gift packaged. 3 weeks for delivery. Half diamond eternity ring, with a total of 1 carat of alternating princess and baguette cut diamonds across a 4.2mm wide band. Channel setting. Baguette diamonds with Princess cut diamonds. Precision setting. 1ct diamond weight. F colour VS1 clarity. Available in 18ct Yellow Gold, 18ct White Gold, 950 Platinum and 950 Palladium. Wood boxed. Gift packaged. 3 weeks for delivery. Medium weight court profile wedding band with 0.35cts round brilliant cut diamonds. 5 stone channel set princess cut diamond wedding ring, holding 5 x 2mm princess cut diamonds in a continuous channel set flat court profile design. Sublime princess cut diamond set wedding ring. A sleek and elegant flat court profile band, holds a continuous channel of princess cut diamonds, weighing 0.25 carats in total, measuring 2mm across the channel. Each diamond is precision set in this wonderful design which takes around 4 weeks to produce. Experience the subtle sparkle and impressive fire within this square diamond half eternity ring. Held within bar settings, a total of 1 carat of square cut diamonds dazzle within a 3.75mm wide design, benefitting from a comfortable court shaped band, ideal for daily wear. Carré Cut Diamonds, Bar setting, Half diamond set. 3.75mm width. 1.0cts diamonds. F - G colour VS clarity. Available in 18ct Yellow Gold, 18ct White Gold, 950 Platinum and 950 Palladium. Wood boxed. Luxury packaging and diamond grading certificate. 4 weeks for delivery. A dazzling square Carre cut diamond eternity ring featuring a half eternity ring design with precision cut sparkling square Carre cut diamonds, with a total 0.50 carats diamond weight. This distinctive half diamond eternity ring features F-G colour VS clarity square Carre cut diamonds, 0.50 carats in weight. Styled with a 3mm court profile band, this comfortable design includes bar settings to secure each diamond and is crafted to order within 4 weeks. Available with international courier delivery to your door. Half diamond eternity ring, holding 0.56cts of channel set diamonds across a 3.8mm wide band. Channel setting. 3.8mm width. 0.56cts diamonds. F colour VS1 clarity. Precision setting. Available in 18ct Yellow Gold, 18ct White Gold, 950 Platinum and 950 Palladium. Wood boxed. Gift packaged. 3 weeks for delivery. The half eternity serves a wonderful purpose in different ways. Firstly there is the element of cost, with a half set band requiring a lesser proportion of diamonds compared the the fully set equivalent. The fact that diamonds are less visible on the underside (until the hand is inverted) makes this a wise and savvy choice for the discerning shopper. Nobody can doubt the luxury of a fully set band, but the half eternity does allow a finer band (where required) behind the finger and room to manoeuvre for slight finger size adjustments. There is no variation in occasion for a half eternity ring. Given after a duration following marriage or the birth of a first child, the purchase is typically a personal one with individual meaning and interpretation. The range of styles we have on offer varies quite considerably from the classic princess cut half eternity ring to the more elaborate mixed diamond cuts, such as the round and baguette half eternity within in a channel setting. Many of our rings are created in house, and others come from the renowned Raphael Collection. We can machine any style, width and profile, as a fully customised design, with adaptation being offered to accommodate the setting of a ring sat alongside.